For quality gate repair services in California give us a call. Our skilled technicians offer you the best in openers, gate parts and intercom systems, and you can also count on our regular maintenance service in order to keep your gate in top condition for many years to come. We are a professional gate repair company that deals in timely maintenance, servicing and installation services of residential gates. We work with all kinds of systems from a variety of brands such as All-o-Matic gates, Eagle, Elite and Ramset. Finding a gate repair company doesn’t have to be a daunting task. Now that you have found us, we can be your convenient and reasonably priced gate repair business in North Hollywood. We have a pleasant staff of experts and technicians that can assist you with all of your needs. The services we offer area always have the best rates in town. We also offer emergency repair services, so give us a call whenever you need us. Other than gate repair, we also offer gate installation and replacement services. Then if you’re looking to purchase a brand new door, you can buy one from our site. There are plenty of name brands available to you. Our earnest company is experienced with various sliding and swing gate operator systems. 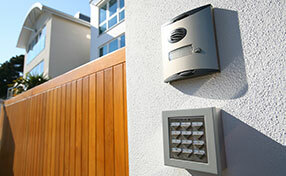 We have the expert knowledge to service high tech keypads and program intercom systems. Elite is one of the major manufacturers of such sophisticated systems and our team is equipped with the right tools for their repair needs. Specialists are knowledgeable of all innovative products made by this brand and have the ability to flawlessly install them. In addition, provide opener, remote, and intercom repair plus guarantee to be fast when customers urgently need us. Since problems with operators can cause multiple problems related to one's safety, security, and convenience, same day gate opener repair plus any problems related to either keypads or phone enter systems are fully addressed for this brand. If you own a business or home in North Hollywood that has a gate, take down our number. You never know when you will need assistance with gate repairs or replacements. Our technicians are always available to take your call, especially during emergencies. No matter what day or time, you can call us to help with gate repairs. You can reach us at 818-742-9198. You can also stop by our office at 6007 Lankershim Blvd North Hollywood, CA 91606. Why work with us? Well, if you ask anyone that has hired us in North Hollywood, they will tell you that we are a courteous and professional company that puts the customer first…always. To top off the top quality gate repair and installation services that we offer, we also sell gates from top name brands like Liftmaster, Elite, Eagle, Door King, BSL, Ramset, All-O-Matic, Sentex and FAAC. They all have affordable prices and come with different styles. You can find sliding gates, driveway gates, sensor gates, garage gates, electronic gates, automatic gates and a variety of others. The gate repair and installation technicians we have are all licensed, bonded and insured. Never work with a gate repair company that doesn’t offer you that security. You never want to trust a technician that will hold you financially liable for any damages that incur. When you’re working with us, you’re guaranteed to be satisfied. Our mission is to ensure that all of our customers are left with smiles. The process of overhead gate opener installation begins with the setup of the motor unit. The motor unit is mounted right under the ceiling with the use of a special bracket. Its distance from the wall above the gate is selected in line with the height of the unit. The rail, which houses the drive, is installed so that it extends from the motor unit to the wall over the gate. Once the trolley is attached to the rail, it is connected to a moving arm. The moving arm is attached to the gate. The installation of safety sensors that are connected to the opener is voluntary, but recommended. Once all system components are connected, the travel limits and the force of the opener are adjusted in line with the weight of the gate and the setting of the springs. The final step involves the programming of the remote controls. 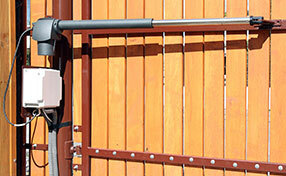 We provide pool gate installation, replacement and repair services. 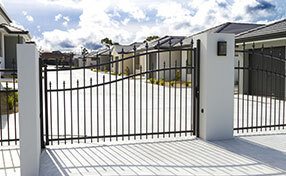 Such gates are useful for residences with pools or public buildings with pools. In either case, the services offered by our company are extremely important. With our repair services, you can be sure that your gate will work properly and, thus, keep strangers out and your children secure. We install them with great attention and repair possible problems fast. You can depend on us for same day gate hinge repair and trust us for all services related to pool gates. We maintain them with equal thoroughness and make sure they open and close all the way, noiselessly and properly. Because it’s outside, exposed to the elements, your residential home installation gate needs a lot of attention and care. Routine maintenance is a must, and getting a trained professional to do an annual inspection is something you definitely have to keep in mind. While many homes still have manually-operated gates, more and more homes today are slowly switching to electric or automatic gate clicker systems because they are more convenient to operate, and are easy to use as well.